My parents and I signed up for a mini triathlon at the beginning of August. And the training has begun! Today we biked and swam - no running yet.. Anyways, I'm over at my parents' house, so I don't have my polish or camera. 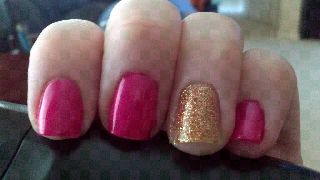 But I managed to find some cute polish! This is NYC Midtown (pink) and The Icing's knock-off of the China Glaze Electrify. It's hard to tell from my cell phone picture, but it's nearly identical. And I have a feeling it was way cheaper... lol. P.S. This Blogger app on my phone is terrible with pictures!! I promise it's not that blurry and filled with checkers... Weird. Dislike.